7.50 points at 14 votes (rank 208). Our adorable and also a bit blue-eyed heroine Molly was kidnapped be the Evil Spud! You still hear her scream "Eek! Help, Spike! ", when he takes her away. Only you as Spike can rescue her from the claws of this horrible Spud. 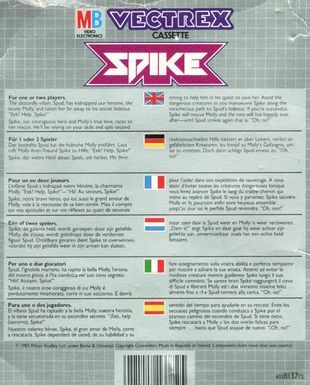 Spike instantly enters the game area through the door and now you take over the controls. In the game are there are three platform levels which can be connnected with a ladder. Its position can also be determined by you. Above the upper level you find the cell in which Molly is locked. To enable Spike to help her, you have to move him up to the uppermost level with the help of the ladder. For this you can make him move to the left or right and climb up or down the ladder with the joystick. To reach the uppermost level faster you can move the ladder (joystick backwards and fire). Additionally the cell key needs to be collected which appears randomly on any of the platform levels. After the first round Spud sends also his helpers, the "Bouncers". They will try everything to keep Spike from reaching the cell in which Molly is locked. In the third and the followng rounds also birds support the Bouncers. But Spike can defend himself by kicking with the foot (keep fire button pressed and joystick left or right), this also gets you bonus points. But Spike can not kick as long as he is standing on a ladder. As soon as Spike has the key to Molly's cell and reached the upper level of the game area, he has to stand below the cell and jump to rescue Molly. If Spike is touched by one of Spud's helpers or falls into a gap in the platform and below that is also a gap in the path or if he touches the border of the screen, this will cost a life and he has to restart from the lowest platform. After the first round Molly's bow falls from the cell. If Spike catches it, all his enemies will be "frozen" for a short time, which of course makes life easier for him. After the first three rounds of the game Spud's helpers will move faster with every further level. Later also the movement of the platforms will change after each successful kick on a Bouncer or a bird. Spud will also participate and throw bombs. Spike starts with four lives and gets and extra life every 10.000 points. A very nice and exact conversion of the Vectrex game with the same name. Also the speech output is well done. 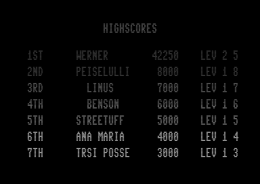 Furthermore there is a highscore list that is saved on disk (and can also be reset), a manual in the game and build-in cheats. In the version by TRSI (with intro) you find next to a highscore reseter also different trainers as unlimited lives, invulnerable, level selection and stage selection. H.T.W: "An utterly lovingly conversion of this classic. The funny speech output, the comic-like graphics, the good controls let the retro-feeling really come up here. In addtion a highscore list that is saved. What is there left to wish? If you haven't played it yet, try it now! DARNIT!". Sledgie: "The game is really great and his a high addictive potential! EEEK! HELP, SPIKE." 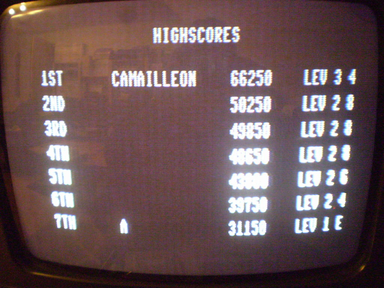 Camailleon: "The best proof that a game can be lots of fun without lavish graphics. The conversion for the C64 is very close to the original. For me a great and cuddly game with fair rising difficulty grade and very much motivation to try it again and again. Recommendable!" 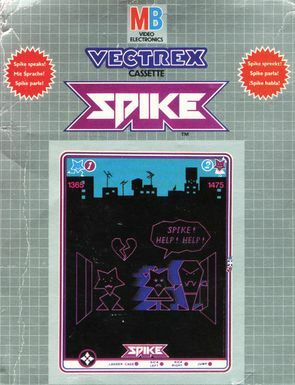 The game is a Vectrex conversion, published as part of the Breakpoint 2010 and and came in second in the category "96k Game". There was no official cover released for the C64 conversion of the game, therefore we display here the cover of the Vectrex original.